Even if accompanied initially by strong emotions, as the survivor expresses her feelings and thoughts into the empathic listening of the therapist, the upsets begin to shrink. They start to shrink, and continue to do so with each iteration. The events begin to morph and change into something less confronting, monstrous, or compulsive. Even though language does not create what happened, language allows access to what happened. Language allows the speakers to capture the experience. And if the person can capture the experiences, including imaginary and psychic ones, the person can eventually release and lose them too. This is because describing and redescribing the event itself uses language that is semantically rich and ambiguous – inherently structuring and creating distances and distinctions. Though the violations may never entirely disappear, they becomes less menacing, intrusive, and disruptive. 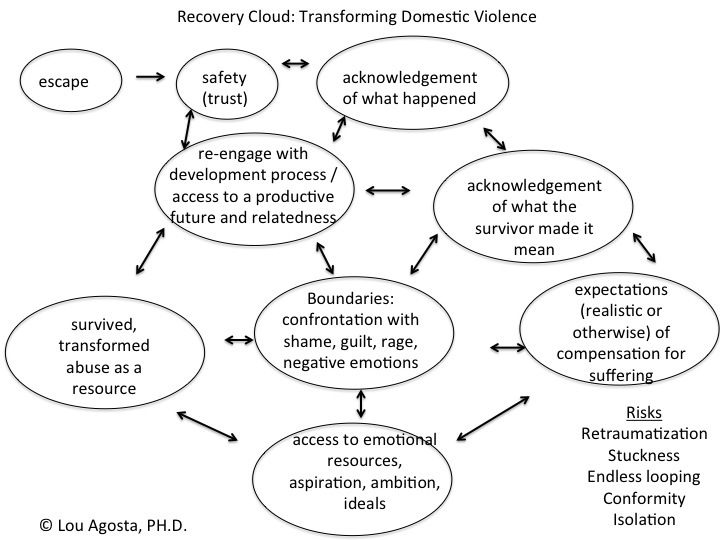 9 Steps to Recovery From Domestic Violence (DV) – One Picture was originally published @ Listening With Empathy and has been syndicated with permission.